A film that tries pretty hard to capture what made the original two movies work, this one is better than most of the alien sequels, but it still doesn’t measure up anywhere close to the first two movies. Alien Covenant attempts to make up for Prometheus, the film in this new Alien series that just couldn’t get things right. Covenant does better. It’s a movie that has tons of ideas, so much so, that it loses focus of what made this series work so well in the first place. The simplicity. Here, they try to capture what the first film did, (the final act on board the ship is like a retread of the first film,) but they do this by myself fung it together with so many other moving parts. Some of it works, some of it doesn’t. Mostly the thing to take away from this is that the momentum of the series is gone and that less is more. At this point, it’s sad to have to say, the Alien franchise is kind of doomed. About five years ago or so, when news broke that two prominent directors, Ridley Scott and Neil Blomkamp (District 9,) were interested in making new Alien movies, the world got excited. Blomkamp even publicly shared his ideas, such as going back and making a sequel to Aliens (the second movie of the franchise,) as if the other sequels didn’t exist. He shared artwork for the potential film, which depicted the return of Sigourney Weaver. And Weaver, herself, spoke about doing the movie, while on tour promoting another movie she worked with Blomkamp on, Chappie. And that led to Alien: Covenant. To clear up the timeline for just a moment, (or at least attempt to,) Prometheus and Alien: Covenant are both prequels to the original Alien films. And Alien: Covenant is the direct sequel to Prometheus. The studio was not happy with the results of Prometheus, and so they clearly made some demands on Scott for this him before giving him the green light. First, the word “Alien,” had to be back in the title. And second, the movie needed to feature some Aliens that looked like the kind we were used to. No more getting artsy or fancy. It was time to give the public what they wanted. And Alien Covenant definitely does that. It’s a movie for the fans. It takes elements from both of the first two movies, (Alien and Aliens,) and it tries to make them work. The problem is, it’s too little too late. If this movie had come out at the time when the public was all hyped up for Prometheus, it would have worked. This was the movie they should have made at that time. But the public gave them a chance, and they blew it. And now, the interest level is gone. That’s why I have to say the Alien franchise is doomed. At least as far as these Prometheus related prequels go. Maybe the Blomkamp – Sigourney Weaver project will happen one day and bring some life back to the franchise. In the meantime, we just have to look at this film and admire it for correcting the things that Prometheus clearly did wrong. 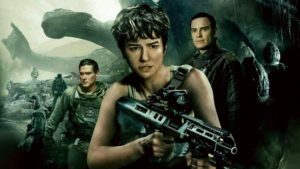 Alien: Covenant is about a crew traveling to another planet in space, ready to colonize it. There are a whole ton of passengers on board the ship, who are in a deep hyper-sleep, and are traveling to a new planet to live. These passengers are called colonists. And then there’s the crew. An uncredited James Franco is the captain, only he dies before we even know it’s James Franco in the role, (we learn that while watching a video of him, after his death.) Way to call in a favor Danny McBride. What a waste. After that character dies, the new captain who takes over is a religious man named Oram, (Billy Crudup.) He finds himself in conflict over the decisions he makes with Daniels (Katherine Waterson,) who was the wife of the Franco character. The big issue that they disagree on is whether or not they should change the course of their plan and go to a different planet instead of the one they were setting out for. The planet they were headed towards seemed ready to colonize. But then they head a voice over their frequency which was clearly coming from another planet. This place was not on their radar, and they didn’t even know it existed. But the voice is enough to make Oram decide to take his crew their and so much try completely change both their direction and mission. Along with the crew is a robot named Walter. As played by Michael Fasbender, he looks exactly like the robot named David, (also played by Fasbender,) in the last movie. Considering that Naomi Rapace, (who was the star of Prometheus,) is nowhere to be found in this film, it is safe to say that Fasbender has now become the face of these movies, (the new Alien trilogy or Prometheus films.) Here, there are some doppelgänger moments where Walter com s face to face with another version of himself, and as much as it’s yrying to be fresh, with something like that, it really isn’t. For one thing, we just saw that a few months earlier in the movie Logan. And having Fasbender as the face of the franchise is no substitute for Sigourney Weaver. So our crew goes down to the planet, and sets out on foot to explore. There’s something in the air. It goes into the ear of one guy and the nose of another. Why do these guys have skin exposed at all? Of course, the film has to make the guy who first gets attacked seem like a villain, simply because he sneaks off to have a cigarette. Can’t have anyone moral and innocent get killed first. Once he and the other guy are struck by whatever was in the air, it’s a countdown until things get worse. We all know what’s coming. Shortly after this, aliens bust out of their stomaches. This marks the end of act one. It’s a chase around to kill the aliens, and its gross and fun, but not a whole lot more. The excitement is there, the intelligence is not. In the second act, the crew is rescued by David. The doppelgänger. He seems like a great guy, and was clearly the one who created the signal which drew them all to the planet, but what is he really all about? The movie opened with a prologue of a conversation betweeb David and his maker, (Guy Pearce,) about why the robots need us, and how they will outlive and outlast us. Does David think he’s better than humans? We learn that the later models of David, like Walter, are programmed so that they’re unable to create anything? All this raises suspicion. There are some very dull conversations in this act between David and Walter. The movie doesn’t do enough to keep us interested during this part of the film, and it feels lengthy and tiresome. Sure, it can’t be all action, and we don’t really want that, but whatever is going on with David, we are not given enough clues to really be interested. The third and final act features aliens that are running loose on the ship. This is a complete call back to the original film, where the entire movie was just a single alien running wild on a space ship. In that film, it worked because of its simplicity. It was meant to feel like a haunted house movie on a spacecraft. Here, in Alien: Covenant, it’s just the final act. We’ve come s long way, but how much have we lost in the process? Those first movies took the time the give us details and thrills. The more recent films don’t spend any time on the buildup. 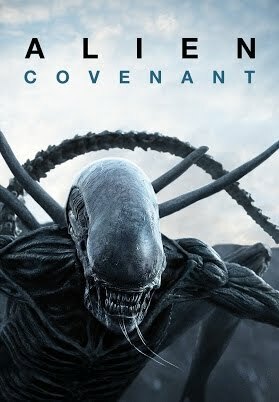 This is a far superior movie to Prometheus, but that’s not saying much. Alien Covenant is the movie that tries to do too much. It would have been better served by a focus on real moments, build up, and details. We don’t get to know the characters enough to really care about them, and instead, what we get is a movie that clearly has an agenda. Some of it works, but with this one, it’s safe to say that whatever was so special about those first two movies is clearly gone.